Instant Imprints Arlington Heights, IL | Custom T-Shirts, Embroidery, Signs and More! At Instant Imprints Arlington Heights, Illinois, our customers come to us when they want to be more visible to their customers. We create that visibility five different ways: Branded Apparel (embroidery), Signs & Banners, Promotional Products, Custom T-Shirts and Print Services. Are you looking to promote an event, sports team or business with custom t-shirts, printing services, promotional products, custom banners or branded embroidery items? Then Instant Imprints in Arlington Heights has the solutions for you! We have the latest production processes to help you craft a superior promotional good. Whether you’re looking for team jerseys, customized work uniforms or storefront signs, our print shop has what it takes to get your project done right! Just ask your smart speaker, “Where’s the best print shop near me?” and you’ll be sure to find us on E Rand Rd! At Instant Imprints, we are motivated by our commitment to provide a superior service. This means we get your job done right the first time and delivered when you need it. We deliver a world-class service with a local touch that only our Arlington Heights Image Experts could provide, helping you achieve your promotional goals, no matter what they are! In addition, your project is created start to finish under one roof, right here in Arlington Heights. Businesses all around the country know the promotional power that custom t-shirts can provide. Whether you’re looking to promote an upcoming event, push a new product or show off your brand as a whole, our Image Experts are ready to help you get the job done right. Wherever your custom tee travels, your brand will be represented in style. If you’re looking for an even classier way to customize professional work clothes or other garments, our custom embroidery service is for you. 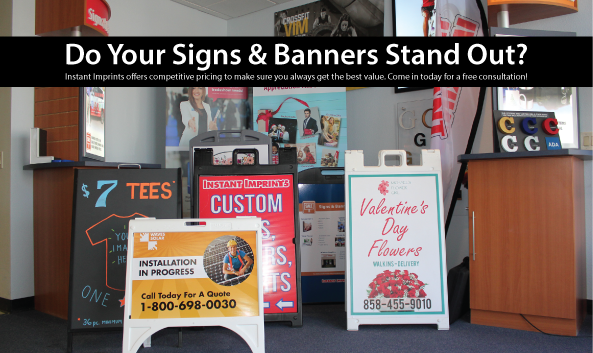 Businesses all around Illinois use custom signs and banners to reach more prospective customers, wherever they may be. When your brand is looking to stand tall, our Arlington Heights Image Experts are at-the-ready to help you find the perfect custom sign solution. You can use a stylish sidewalk sign to reach passersby on the street, or use a billboard banner to reach drivers on the roadways. Our Image Experts are happy to help you pick the right color, font and material choices to ensure your custom sign turns heads! When you’re ready to bring your visibility to the next level, come on by our Arlington Heights showroom, give us a call at (224) 764-2198 or request a quote online today!